A memorial commemorates the contribution of granite from the original Tynong Quarry which was used in the construction of Melbourne's Shrine of Remembrance which was dedicated in 1934. A local amateur geologist, Mary Ryan suggested the use of the granite to the War Memorial Committee. 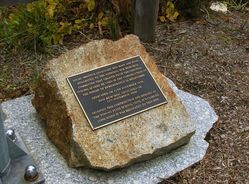 The slab of granite for this memorial was located in the Tynong School until its closure in c1950. Tynong's local quarry provided the remarkable granite used to build one of the country's most famous monuments. The Melbourne shrine's distinctive silver-grey granite cladding came from this rocky outcrop just above the little town of Tynong, about one hour's drive east of Melbourne. A local amateur geologist, Mary Ann Ryan, who took granite samples to Melbourne was crucial in the Tynong stone being selected. The giant blocks were hauled to Melbourne where stonemasons fashioned the slabs of granite into fine, classical shapes and sculptures. The work took six years. The shrine opened to wide acclaim in 1934. 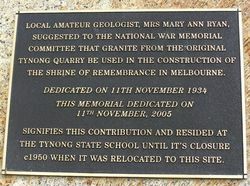 LOCAL AMATEUR GEOLOGIST, MARY ANN RYAN, SUGGESTED TO THE WAR MEMORIAL COMMITTEE THAT GRANITE FROM THE ORIGINAL TYNONG QUARRY BE USED IN THE CONSTRUCTION OF THE SHRINE OF REMEMBRANCE IN MELBOURNE. SIGNIFIES THIS CONTRIBUTION AND RESIDED AT THE TYNONG STATE SCHOOL UNTIL ITS CLOSURE c1950 WHEN IT WAS RELOCATED TO THIS SITE.